When I got home, as is my wont, I eagerly reached for the newspapers that had piled up on the steps. I wanted to find out what happened the past 3 days while I was away at a conference. Staring me in the face was the headline pictured here. My questions are: So what? Are you kidding me? In the oppressive “education system” we inhabit across the country, where the professionals have little to say about their working conditions and students have less to say about curriculum, it’s somewhat easy to “produce” more “graduates”— simply arrange “circumstances” to produce the actuality of more graduates. Think about it! If educators are the “gatekeepers” of who gets credit toward graduation for “educational experience” (worksheets or packets completed?) and schools are being pressured to “increase graduation rates”, it’s a somewhat easy thing to “comply” with the mandate behind the headline. And you can always play the “numbers game” by not counting “students” who have dropped out, disappeared. An organization can always get the numbers if you don’t care how you get them. Reduce suspension rates? Simply don’t suspend. 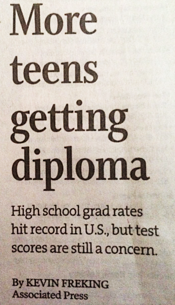 Increase graduation rates? No problem — make some classes easier. Increase profits, ask Wells Fargo, Enron, Tyco, etc. The problem is that this sort of stupidity makes life more difficult for all of us. While “comfort” stories are convenient and distracting, they ignore reality in favor of make-believe. In short, the convenient “comfort story”: “…is a tale/Told by an idiot, full of sound and fury,/Signifying nothing.” (Macbeth, Act 5, Scene 5). Of twenty questions (involving things like government spending, income distribution, and climate change), the majority of people who actually vote most of the time correctly answered 20 percent of the questions. Most recent Civics Assessment conducted by the National Assessment of Educational Progress: that twelfth graders’ civics knowledge and skills actually declined between 1998 and 2010. I now also believe that we are perilously thoughtless about our future. The blunt question is this: what skills, knowledge, or intellectual/social dispositions do graduates of this “game” have to live successfully in the future? My answer, given the decrepit nature of our educational institutions, is not many and not much! But, as Deming said some time ago, we really don’t have to change. Survival, after all, is optional. Perhaps we can change to begin looking more deeply at our own “comfort stories” and start the thoughtful and hard work in service of our students and a democratic future. We need to design learning experiences that engage and stimulate young people while teaching necessary content, helping them make sense of an often crazy world. How do we design our schools (nay, learning experiences) so hands are always meaningfully busy; strong foundations are reliable when the unimaginable changes ahead occur; and joy enables all of us to see the world with artists’ senses?